In today’s sailboat hardware market we will find 3 primary types of cleats. Cam Cleats, Clam Cleats, and Horn Cleats. The clam cleat is almost obsolete in today’s sailboat technology. 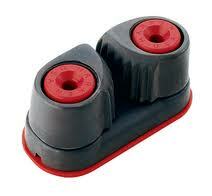 The main problem with them is that they are difficult to secure and easy to un-cleat. 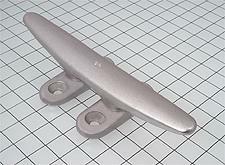 The clam cleat comes in handy in maybe only a few applications that I can think of; a hinged rudder control line like the ones found on Beach Cats, or perhaps a preventer rig that can be undone in a snap if needed. I would still prefer a cam or a rope clutch here as a clam cleat does not do well when the load isn’t static. Yet, they can still be useful were an extremely slim mounting surface is present. Even in this scenario a good two point mount horn cleat would be my first option, if feasible. 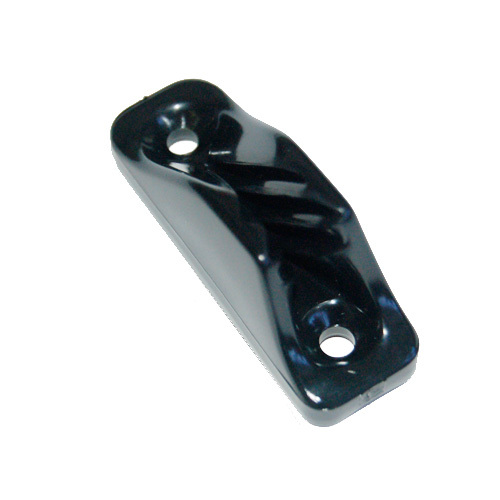 Horn cleats are perhaps the most traditional and when properly configured, the most secure types of cleats. The horn cleat isn’t necessarily hard to belay but it is a bit more tedious than lets say a cam, clam or even a rope clutch (please see the archives for my blog on rope clutches). The un-cleat-ability of the traditional horn cleat is also not difficult but time consuming vs. the others. An improperly installed horn cleat or a horn cleat that has been belayed from the wrong direction, causing the line to lead-in poorly, can cause the cleat to become undone, or even worse cause the cleat to jam! Be aware of small diameter ropes on large cleats as well, as the line made from today’s slippery synthetics will slip and become undone. With smaller, or really slippery line it is good practice to put on a few extra figure eights or maybe even add a half hitch back to the standing end. Another reason that I like the horn cleat so much is that it offers the user the ability to practice one of the fundamentals of boating, belaying dock lines. Sail boaters and power boaters alike share this skill as there is no escape from having to tie up your boat. You can find a diagram of how to properly figure eight a dock line onto a horn cleat here. Last but not least, is my personal favorite, the cam cleat, not to be confused with the aforementioned ‘clam’ cleat :-o. Now here is a genius idea, someone (I don’t know who) has created a small inexpensive yet effective tool to cleat a line. A cam cleat consists of a spring loaded set of jaws with little rope grabbing teeth that will grab and lock even the smallest of lines. The cam cleat allows for secure, easy cleating as well as offers an easy release, genius! All things do have there downsides and nothing is perfect, so if I had to say anything, these little rope grabbing teeth can chew up the line, especially if they have been under static load for long periods of time. Also pay attention around these types of cleats as they too can be undone easily. Aside from that, the cam cleat is a winner in my book and I’m sure you will feel the same once you give them a try. Just like anything else there isn’t one perfect cleat for every application so go see your local rigger, tell them what you are trying to do and see what advice they might have to share. Thanks for reading and remember you can leave us a comment or question below. Hi Gary, show us some pics @ Jimmie@theriggingco.com. Hi Judy, You keep turtling because of a cam cleat???? Is this the cleat for the main sheet? If so (or either way) it sounds like you have to do something. Cam cleats are probably the best style of cleat for easy cleating and unlceating. However maybe send me a picture of it and I can be of more help. Often times, if the angle of the cleat can be adjusted, this is the best way to make it easier to uncleat. Keep in mind easier to uncleat can be mean harder to cleat…so somewhere in between. Like I said fee free to email us some pictures so that I can get a better feel for what we are talking about. I need a replacement cleat for the bow (front) of my old Dolphin Senior sailboat. Do you sell them? We do. Do you know what kind of cleat you’d like? Are looking for an exact match of the old one? …might be tricky but send us a picture of what’s there. Otherwise you may need to fill the old holes, prep and drill the new cleat in place. Just click on our work request form at the top if the page!